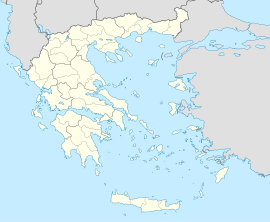 Psychiko (Greek: Ψυχικό) is a suburb o Athens, Greece. Syne the 2011 local govrenment reform, it is pairt o the municipality Filothei-Psychiko, that it is the seat an a municipal unit o.
Psychiko is locatit tae the sooth o the Olympic stadium. Psychiko is a strictly residential suburb o Athens, wi commercial businesses alloued anerly athin twa sma designatit zones, the "Nea Agora" (New Mercat) an the "Palaia Agora" (Auld Mercat), wi current regulations restrictin biggins tae full detachment an aw, an a maximum o 3 floors. Psychiko wis historically the hame o aristocrats, members o the Greek ryal family, an generally auld money fowk. The aurie remains ane o the walthiest suburbs o Athens, wi very heich laund value, an a nummer o embassies, pairticularly o rich Middle Eastren kintras, tae be foond locatit in Psychiko, Neo Psychiko an neebourin Filothei. This wis ance hame tae Queen Frederika o Greece, till the militar coup d'état o 1967. Andreas Papandreou an his wife Margaret livit in Psychiko afore the dictatorship an aw. Later, whan he became Prime Minister he left Psychiko an flittit tae Ekali. In recent decades housomeivver, mony prominent faimilies chuise tae bigg their hooses in the soothren, seaside suburbs, like Glyfada or Lagonisi. A nummer o Greek private schools are located in the area: the Athens College, the Moraitis Schuil, the Arsakeio, an the aurie's maist historic public schuil, the Varvakeio, in Neo Psychiko is the prestigious Greek/French Schuil "Ursulines" an aw. Public municipal facilities, for their pairt, include a vera active cultural centre, a 6-court tennis club, an indoor basketbaa/volleybaa stadium, an ootdoor basketbaa an volleybaa venue, an a rollerskeitchin rink. The name leeterally means "an act o charity". A popular legend aboot the battle o Marathon an the Marathon run wis recordit bi Andreas Karkavitsas in the 19t century, an bi Linos Politis an aw. "Stop", they shouted, wanting to know the outcome of the battle. He stopped a moment to catch his breath and then took the road again. Finally, he reached Psychiko; there he was almost near death, his feet were shaking, he felt like falling down. But he composed himself, took a deep breath, continued, and finally reached Athens. "We won," he said, an immediately fell doun deid. The rider had yet tae come. But whaur the foot runner stoppit an teuk a breath his act was recorded. The first village remained a 'stop' (Stamata) and the second Psychiko. Constantine II o Greece, umwhile Keeng o the Hellenes; competit in the 1960 Simmer Olympics in Roum an aw, winnin a gowd medal. Sofía de Grecia, Queen o Spain, sister o Constantine II. Psychiko is hame tae mony embassies. This page wis last eeditit on 5 Mairch 2018, at 00:53.